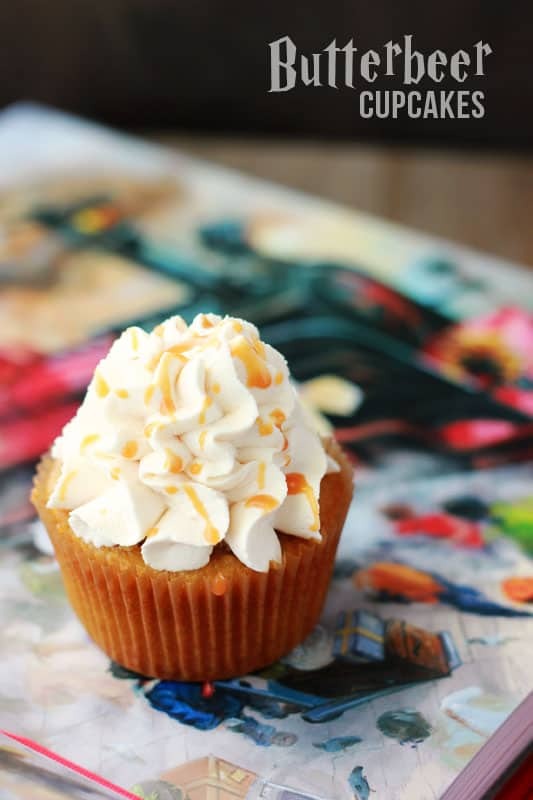 These Harry Potter inspired Butterbeer Cupcakes are the BEST! 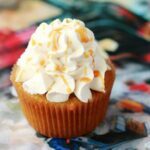 A rich butterscotch cupcake topped with sweetened whipped cream makes these perfect for any witch or wizard! In case you weren’t aware, tomorrow is Harry Potter (and J.K Rowling’s) birthday! As a self proclaimed Harry Potter fan I’ve decided that we MUST celebrate every year (even if it is more just a reason for us to eat cake)! The good news is that my seven year old is right on board with this idea while my husband chooses to ignore us both as we run around the house in Hogwarts House Ties and Homemade Wizard Wands shouting spells at each other. I jumped on the butterbeer band wagon when I found a case in glass bottles in our local grocery store. Since we haven’t officially been to Harry Potter World (but planned vacation soon!) I can only assume that it tastes close to their version… Which is PACKED with butterscotch goodness. That was what I had in mind while creating this recipe. I used a butterscotch cake base, filled the inside with a butterscotch ganache, and to tone things down only slightly I topped everything off with a butterscotch whipped cream! To sum things up in one word… DREAMY. Seriously. I rarely eat more than one cupcake but my husband had to save me from myself and hide these. It was the absolute perfect combination of sweet and not-too-sweet. You just can’t help yourself! Preheat your oven to 350 degrees. Line two muffin tins with paper liners and set aside. Combine 2/3 cup butterscotch chips in a microwave safe bowl with the water. Heat until melted making sure to stir every 20 seconds. Set aside. Stir together the flour, baking soda, baking powder, and salt in a large measuring bowl. Set aside. Whisk together the butter and both sugars in the bowl of an electric mixer until fluffy. Add the eggs, one at a time, followed by the vanilla extract. Slowly stir in the slightly cooled melted butterscotch mixture. Fold in the dry ingredients with the 1 cup of milk until incorporated. Divide between your prepared pan and bake 15-17 minutes or until a toothpick comes out clean. Cool completely. 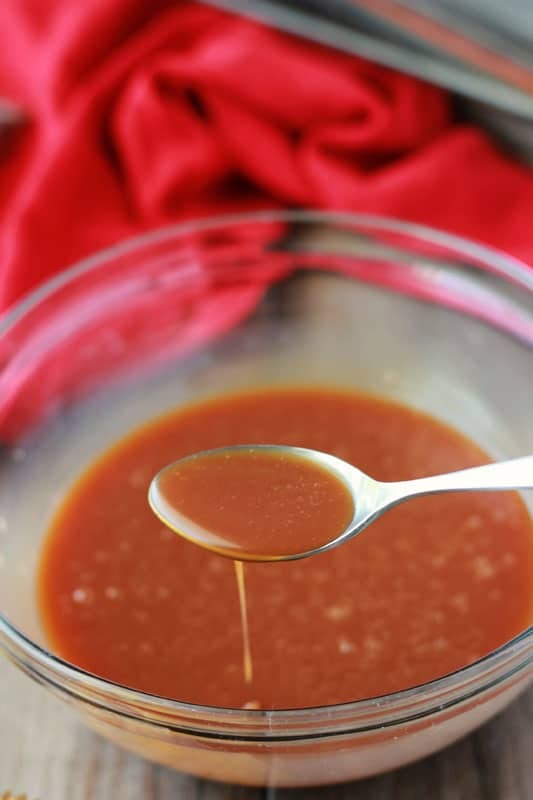 Place the 1 cup of butterscotch chips in a glass bowl. In a saucepan heat 1/2 cup heavy cream until just simmering. Pour over your chips and allow to sit for 5 minutes. Whisk until smooth. 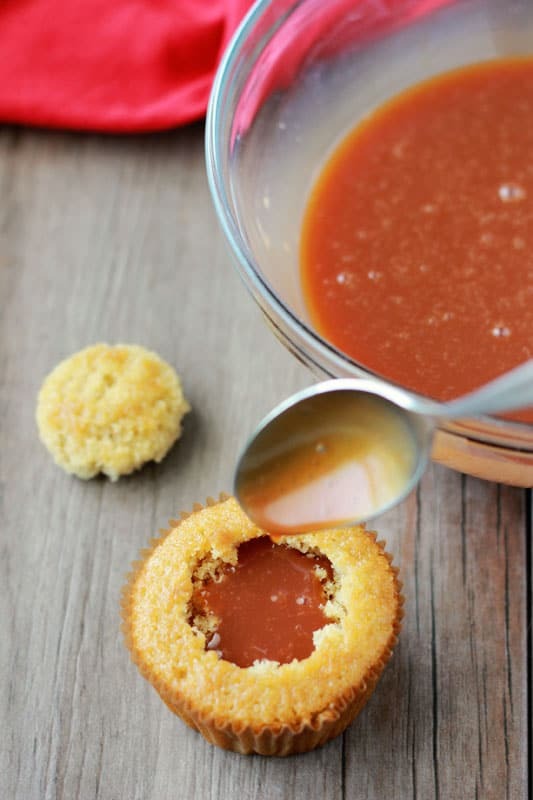 Fill each cupcake with 1 tablespoon of the mixture making sure to reserve 3 tablespoons for the frosting. Place a clean mixing bowl in the freezer for 15 minutes. 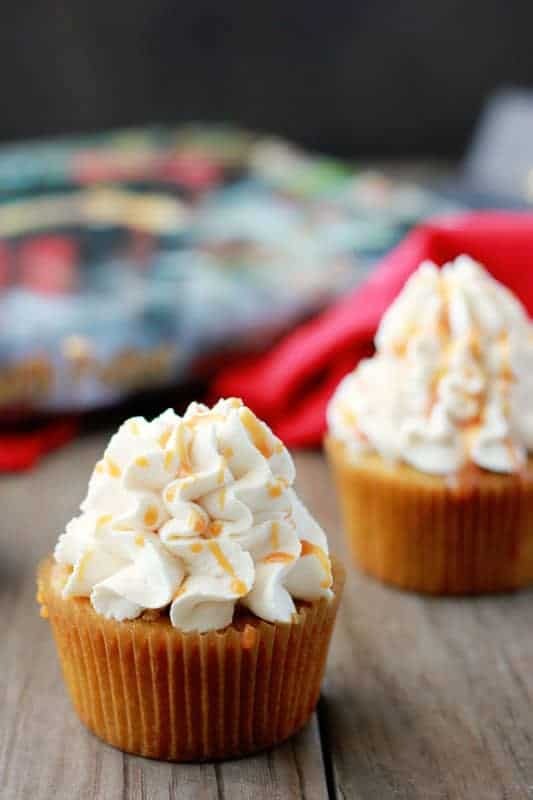 Once chilled whisk 2 cups heavy cream with 3 tablespoons of your butterscotch filling until fluffy. Pipe onto your cupcakes and enjoy. What size tip/shape did you use to pipe your cupcakes? Hi there! You could probably get a similar look with the Wilton 1M tip. Just made these now. The ganache was runnier than I expected. But they looked good. Can’t wait the kids tried them. Hi Winnie, I’m so glad you decided to give these a try and I hope you love them as much as we do!